While the insiders on Wall Street and Washington pander about real financial regulatory reform, former Fed chair Paul Volcker yesterday hit ground zero on this hotly debated topic. The heart of financial regulatory reform is centered on the implementation of leverage by our largest financial institutions. The leverage is exercised in a wide array of activities, both on and off-balance sheet. The capital utilized by the banks in these activities is credit that has not and will not flow directly through to the economy. Why? The banks believe that they will generate a greater return on the capital via proprietary activities rather than facilitating client business and addressing customer needs. Former Federal Reserve Chairman Paul Volcker on Wednesday said banks should operate in a much less risky fashion, including not making trading bets with their own capital, comments that could provoke intensified debates over the future of financial regulation. 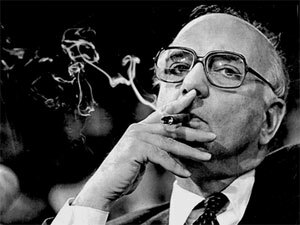 Mr. Volcker, who currently is chairman of the White House’s Economic Recovery Advisory Board, suggested banks should be restricted to trading on their client’s behalf instead of making bets with their own money through internal units that often act like hedge funds. “Extensive participation in the impersonal, transaction-oriented capital market does not seem to me an intrinsic part of commercial banking,” he said in a speech to the Association for Corporate Growth in Los Angeles. Mr. Volcker’s comments could put him at odds with the Obama administration’s proposal for new financial rules. The White House has called for more oversight of banks’ operations but doesn’t push such strict limits on what they do. Asked after his speech if his comments represent a break with the White House’s proposal, he replied: “Nothing I said today should be a surprise” to the administration. Mr. Volcker said he would appear before Congress next week to discuss his views in more detail. A Treasury Department spokesman declined to comment. I look forward to Mr. Volcker’s testimony, and I will certainly not decline to comment. Regulatory Litmus Test: Can the “Four Horsemen” Ride Again?